The most notable chess prodigy in the history of chess, Sergey Karjakin holds all of the records. He has the record for youngest International Master in history (11 years old) and youngest Grandmaster in history (12 years old), records that both continue to stand. He also crossed the 2700 rating mark before he turned 18. So all of these records were broken before he even became a legal adult! Great things to come soon from this bright star. 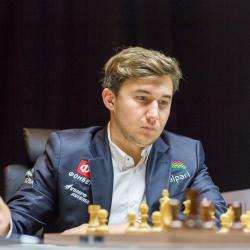 Sergey Karjakin learned to play chess when he was 5 years old and in a short amount of time, he became an International Master when he was 11 years old. He became the youngest Grandmaster in history when, at the age of 12, he was awarded the title. This is a record that still stands to this day. At the age of 14, he defeated Vladimir Kramnik, the reigning World Champion at the time, in a blitz game. He reached the semi-finals of a World Championship qualifier tournament before losing to Alexei Shirov. In January 2008, Karjakin cracked the 2700 rating for the first time, with a rating of 2732 and a world ranking of number 13. He accomplished this feat just before he turned 18 years old. He has continued to add up the tournament victories and high placing throughout the years and is currently ranked among the top 10 players in the world.